Family in Mexico. 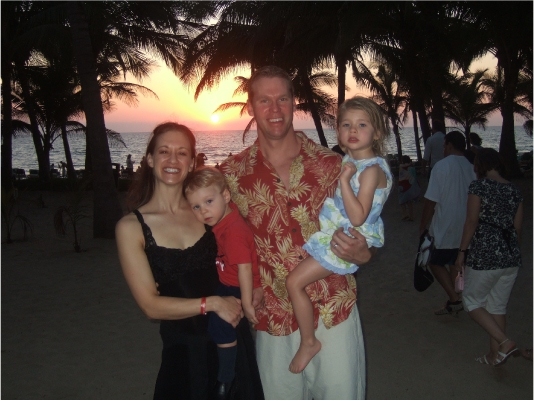 While it was only for a few days, we got to spend time with our daughter Denise and her family along the ocean near Puerto Vallarta. They virtually took one of the last flights out of Minnesota before the airport was closed, the same weekend the Metro Dome collapsed. 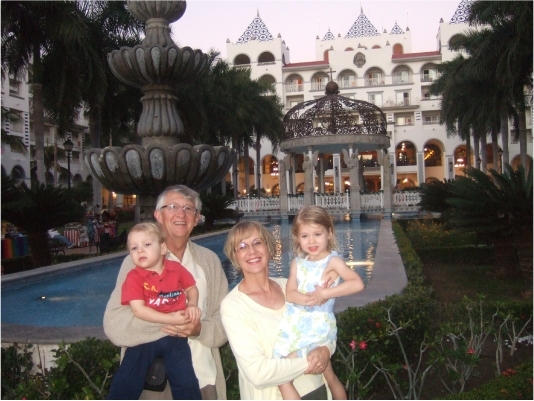 We drove over from Ajijic and spend four glorious days and nights at this "all inclusive" resort playing and relaxing with the kids and grandkids along the beach. 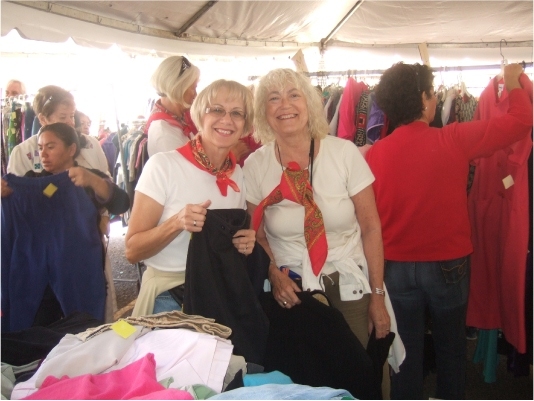 November and December were time for some volunteering for Glorine, Jean and a host of others sorted and priced all sorts of items for the Saint Andrew's Bazaar, one of the largest yard sale in the Ajijic area. One of the benefits of volunteering here is being able to look through all the "stuff" and get first dibs at buying it. Along with some clothing items, Glorine found two dolls, with over five sets of clothing including a bunch of wigs. 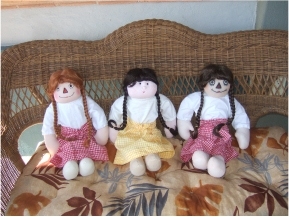 But having three granddaughters and trying to keep things equal, Glorine had the doll on the right sewed by a local seamstress. By all accounts, the dress-up dolls were a hit for Christmas. 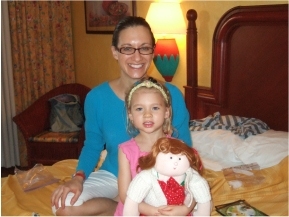 When we arrived in Puerto Vallarta, Clara asked Grandma Glorine if she could open her Christmas gift, the answer was an unwavering yes. After a few change of clothes, we snapped this picture. She was a happy camper. 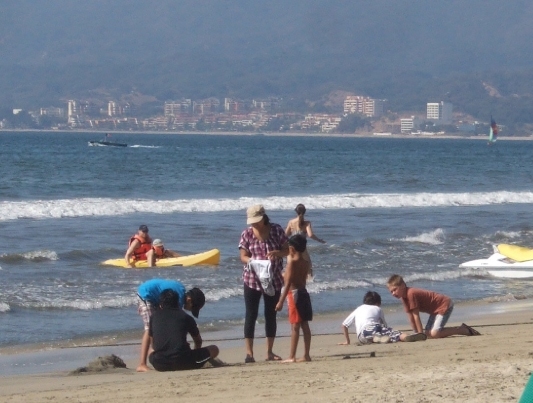 While most coastal resorts cater to adult, this one was truly "and all inclusive." 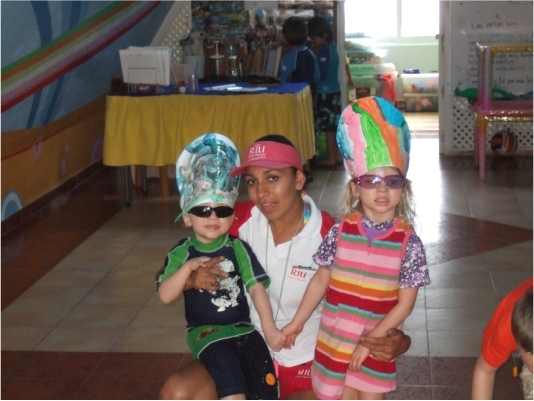 Each day four hours were set aside for kids games. Here Clara and Chase are finishing up painting their hats. 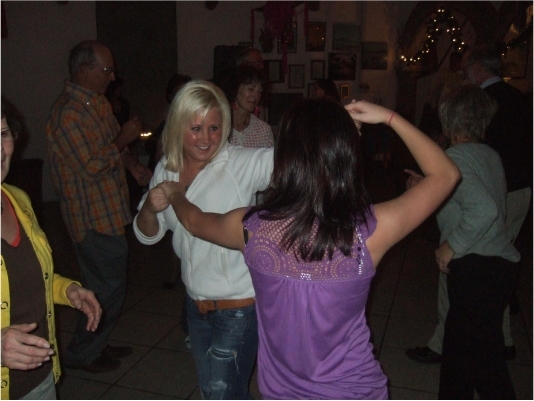 Each day was filled with new events that kept things fun and exciting. Puerto Vallarta is one of many cities that line this part of the western coast of Mexico. 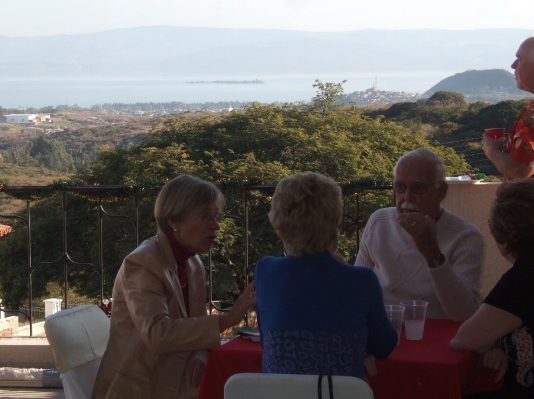 Off in the distance is Bucerias and the resort town we are staying at is actually Nuevo (new) Vallarta. The yellow kayak is Craig and Chase returning from a short ride in the ocean. One of the kids events was a Treasure Hunt and Clara was the first to find it. 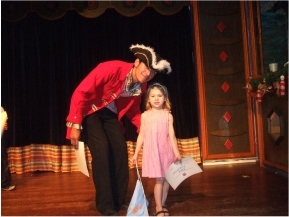 Each evening, the resort hosted family entertainment with music, dancing, pranks and other fun events. This one is recognizing Clara for her winning the Treasure Hunt. Both day and night time temperatures are about five to ten degrees warmer than in Ajijic, which made our stay there doubly comforting. 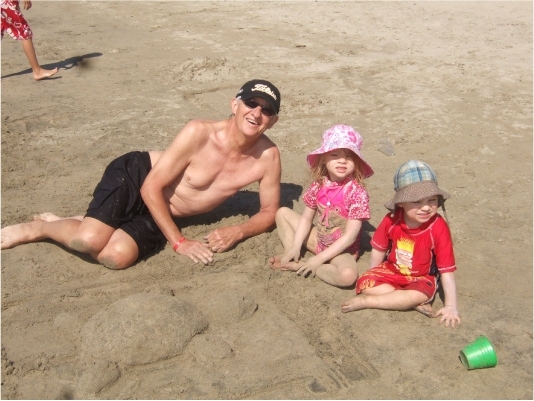 Here Grandpa Larry just finished helping Clara and Chase with this sea turtle. It was not much longer after this picture that the turtle disappeared into the sand. Hmmmm! Getting ready for "date night." 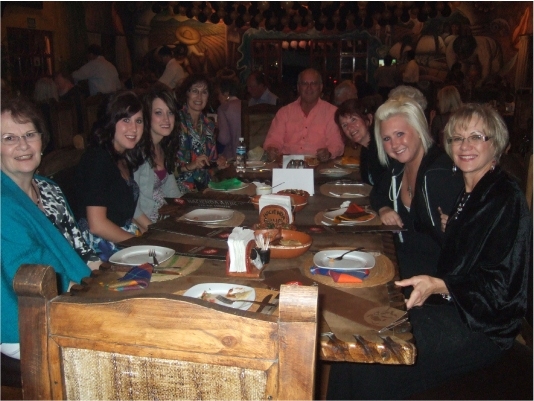 One of the traditions we have with our daughters, is one night we take care of the grandkids while they go out on date night. As we were preparing to start babysitting, we were down by the beach and caught this wonderful picture as the sun was setting for the evening. Back in Ajijic, twas the season. 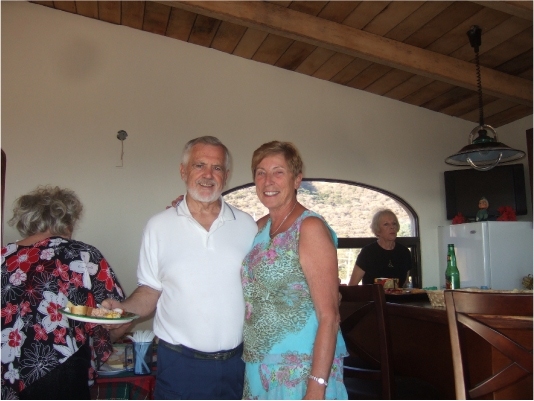 Here Sandy and Walter are hosting a Christmas Eve party. Walter is still putting the finishing touches on this beautiful Hacienda that he has been working on for the past couple of years. The home is set to overlook the city of Chapala and Scorpion Island, out in the middle of Lake Chapala. The entire living quarters are on the main floor, but the second floor is dedicated to parties. Later that evening, we were invited to another Christmas Eve party. This one at Chuck and Jean's home. 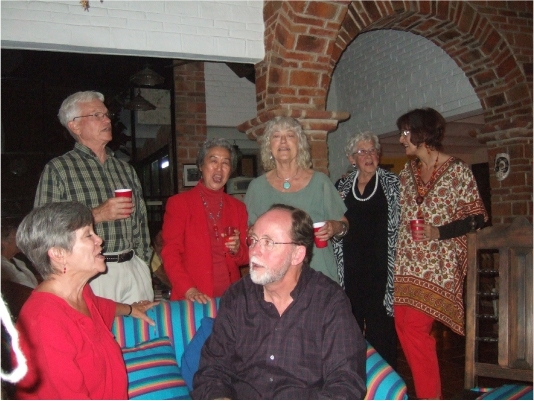 After another wonderful meal, some of the guests broke out in Christmas caroling. 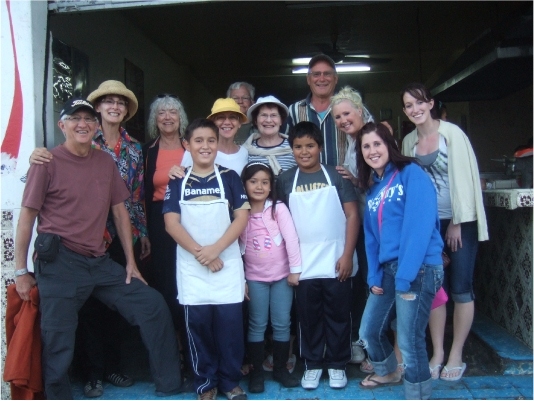 One of the traditions of El Parque is their annual Christmas Dinner - turkey and all the dressings. And we also got to invite friends to joins us who do not live in the complex. 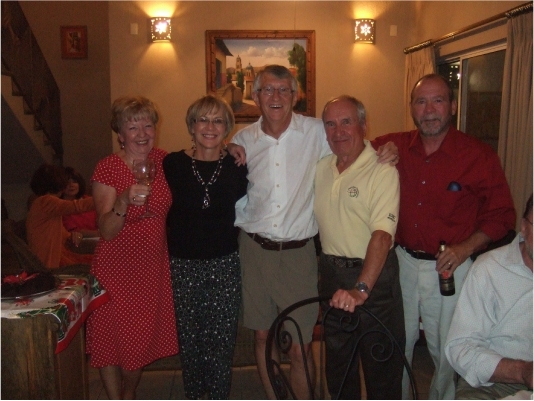 Later that evening we invited some additional friends over for the last of a marathon Christmas partying. Here we are with friend Jerry and the couple (Peter and Maureen) who lived in the home we lived in last year. They have since moved on to Puerto	Vallarta for two months before returning to Canada. 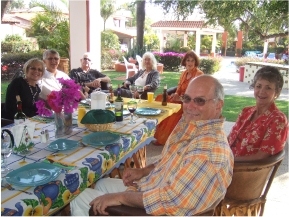 One of the exciting things about living in Ajijic is the diversity of friends we have made over the past four years. Here is our friend Shiz, who invited us to a dinner party with several other people. During the party, she received a big surprise by being honored by a group who rescues injured animals. 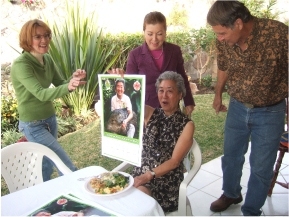 The poster shows her holding a wild boar hog with a 2011 calendar along the bottom. Glorine and Maureen's sister Marlene liked Ajijic so much last winter that she came back for another visit along with three of her grandchildren. Here they are exploring the "tiangas," which is a weekly market with hundreds of vendors selling anything from veggies to DVDs to clothing. Here is one of the many homes we took them to, to show the stark contrast in homes in the area. Between Marlene are sisters Brittney and Christa and to the left is their cousin Carly. We continued our regular routine and Marlene and the girls seemed to fit right in. 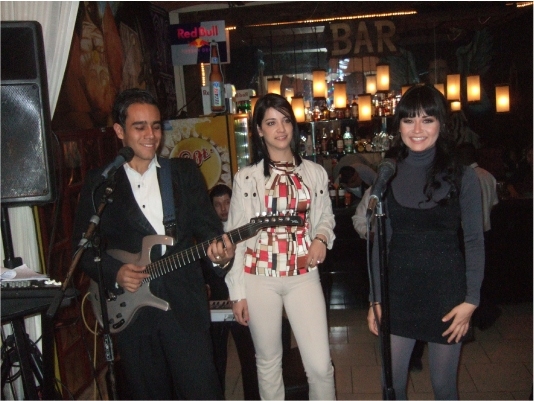 Here we are at Manix with one of Ajijic's local artists singing and playing the piano. 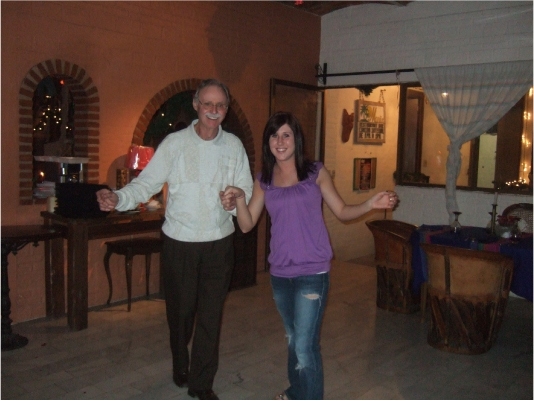 Jim, one of the regulars at Manix took full advantage of the situation and got all the girls out on the dance floor. 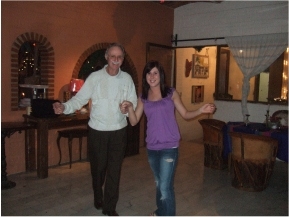 Jim is a dance instructor and within a song or two, the girls were able to get the dance steps down. 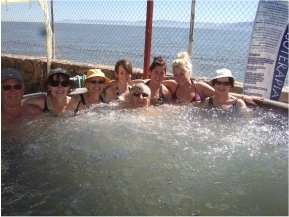 Another tradition is the thermal spas that sit along Lake Chapala. 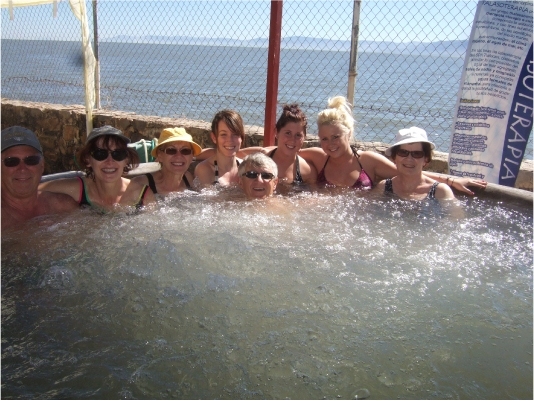 Here we are soaking in one of a dozen different mineral baths that claim to cure nearly every disease known to human kind. We were there just for the enjoyment. 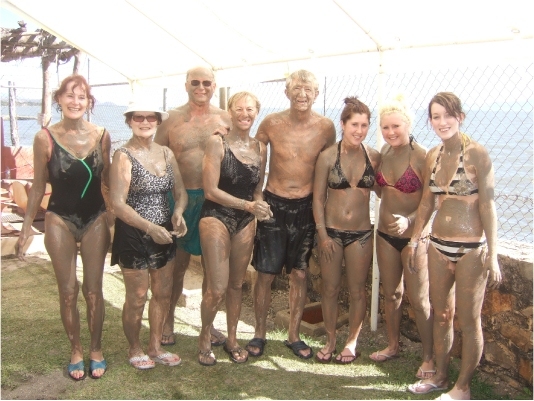 The experience would not be complete without the mud/clay bath. This is not truly a bath, but rather spreading clay over our bodies, letting it dry in the sun, then jumping into the final hot tub of the day to clean off all the mud - a detoxifying experience or just fun. You be the judge. While in the area, we drove to a couple of Malecons (or boardwalks build along the water's edge). This one is in the city of Jocotepec and sports a lot of art work. The girls took advantage of the fish turned seat. 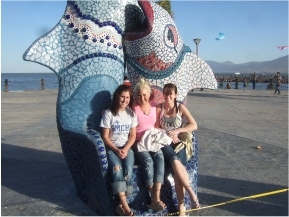 From the Malecon, we stopped by a taco stand that any sensible gringo would walk by. However, we were treated to this "organically grown beef" restaurant last year and knew that everyone (including the people who work there) would get a kick out off. The picture says it all!! HAPPY NEW YEARS!! We are all dressed up and ready to ring in the new year. 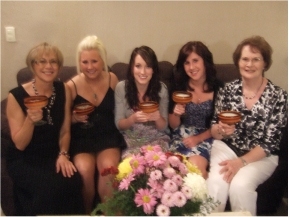 But before leaving the house, we decided to have a pre New Year's Eve toast with a round of Margaritas. 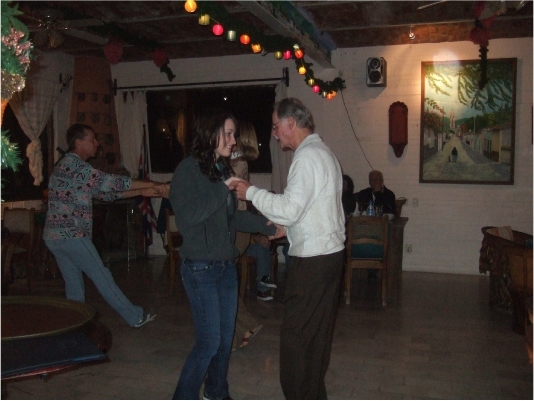 Ajijic Hacienda is the name of the restaurant which we stumbled across just a few weeks before New Year's Eve. Friends Quinton and Rose made the arrangements with the restaurant and 37 of our friends decided that this would be the place to ring in the New Year. In all, we were treated to three different bands. The first band was a one-man band for some warm up entertainment. Then this group of kids came on and provided some wonderful American and Latin music geared for dancing. In Mexico, New Years would not be complete without the sounds of a Mariachi band, which by chance originated right here in the state of Jalisco. Even some of the waiters got into the action and danced with the girls. 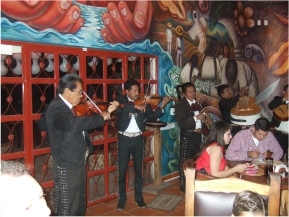 The owner of the restaurant took them under his wing and treated them all to a round of one of Mexico's finest Tequilas. All and all, they had a memorable New Year's Eve. 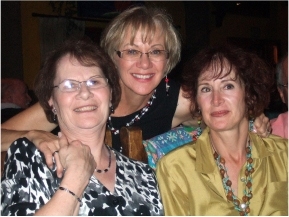 While the girls were 40 years our junior, that did not stop them from having a unique and enjoyable New Year's Eve. 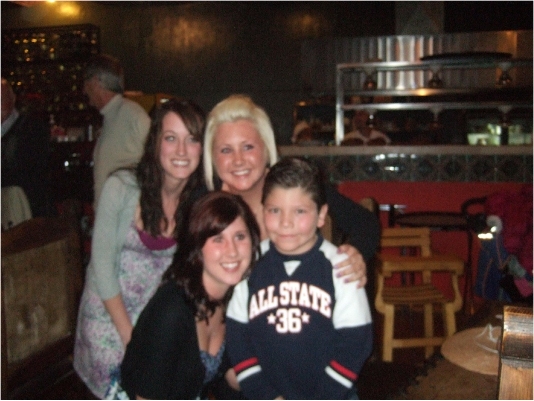 Even though he wasn't their age they danced with this young boy. Later he asked his mother, "Which one of these three girls was his girlfriend"? 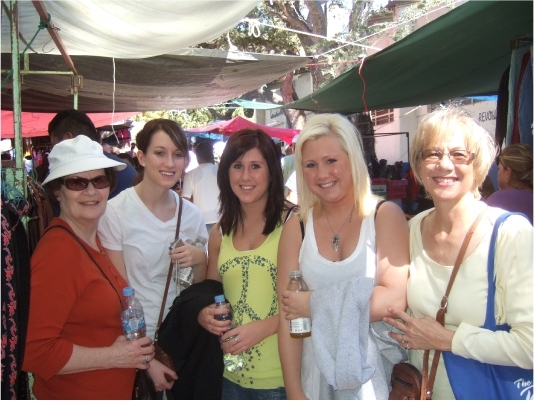 It was great to have Marlene here and to see her enjoy the warmth and sunny days of Ajijic, especially with three of her grandkids. Next year she will be back, with four of them!! 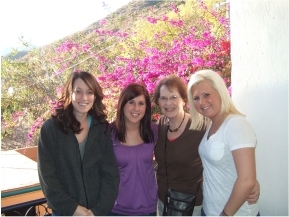 While too many American are transfixed on the drug violence, Glorine and Maureen had no doubt that Marlene and the grandkids would not only be safe, but more importantly make memories that will last throughout 2011 if not a life time. Happy New Year to all.